Thank Your For a Wonderful Season 2!! Well, we’ve reached the end of another great season of the Global Growers Farm Share and have a few final items to share with you. First, we wanted to thank you for being a member and supporting our partner farmers throughout the year. The Farm Share is the most consistent source of income for our partner farmers, providing steady pay throughout the season, making it easier to budget and plan, and allowing them to work on the farm full-time. Thank you for being a part of the work we do. Second, while you all surely know about the work we do at the farm (and where your veggies are coming from! ), you may not know about our network of community gardens in DeKalb County. The gardens provide a space for local families to grow food that is connected to their culture and traditions. The gardens also keep memories alive, build community, and provide comfort and purpose. Our goal is to raise $15,000 by the end of the year to support hundreds of new Americans as they put down roots in their new HOME and GROW healthy food for their new community. We are already 25% of the way - if each of you donates just $25 we could almost reach the half-way point! Learn more about the campaign and make your contribution here. Finally, we’ll be sending out a survey about your Farm Share experience in the next week. The survey responses help us shape next year’s Farm Share program to better meet your needs, so if you have feedback, now is the time to share it! Look out for an email with the survey link next week. If you complete the survey before December 21, you’ll be entered to win a Global Growers tote bag! Did you know Georgia has a growing citrus industry? Satsumas are small, seedless oranges with thin skin that's easy to peel. They are juicy, very sweet and low in acid. A cousin to mandarin oranges that are being grown throughout Southeastern Georgia. Just Bakery is a great non-profit organization here in Atlanta and we are super excited to be able to include them as this weeks partner product! Just Bakery is "designed to train, certify, and hire refugees while providing a living wage, producing delicious baked goods, and building a diverse and compassionate community. 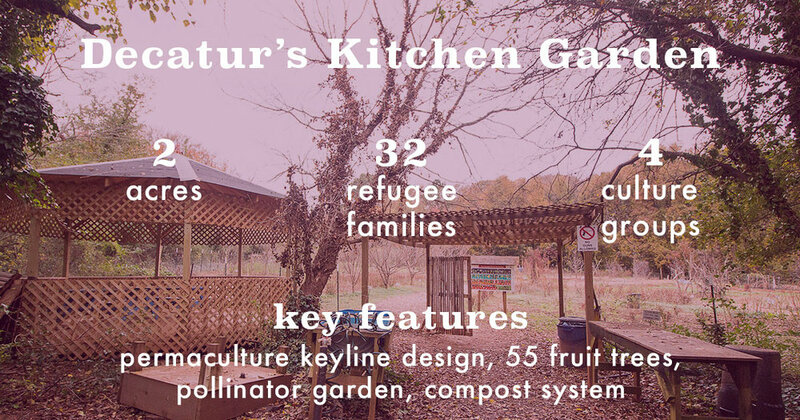 We aim to be a viable option for next steps in the resettlement process through building long-term sustainability and economic security as our refugee neighbors recreate home in the Atlanta area". Great to feed a group of folks and something not too heavy before or after we’ve gorged ourselves through the holidays. Make the rice a day or two ahead for a quick and easy to assemble meal. Tomorrow, December 1st, we will be set up selling fresh veggies and holiday baskets among many other great vendors for Midtown International School’s Winter Arts Market. Come say hi from 11 am-4 pm and check out some local artisan vendors, grab a bite and bring your people. Get ahead of all of your holiday shopping. Christmas is only a mere three weeks away and Hanukkah starts on Sunday! It’s a great way to shop unique gifts and support local business. After carefully tending these trees & then harvesting the pods, the farmers ferment the seeds in wooden boxes for days before drying them in the tropical sun. Now referred to as cacao beans or cocoa beans, these seeds get inspected, weighed & shipped to Atlanta, where we hand sort them, pulling out any that are flawed. We then roast the beans ourselves, and crack & winnow them before adding them to our stone grinders where they will grind for days, slowly turning into liquid that we then temper and mold into bars we wrap by hand. A beautiful take on a coleslaw that is full of great texture. Make this for your friends, family or yourself and pretend it’s July! #GivingTuesday is a globally-celebrated day of solidarity and generosity. It is a day where you can take a stance for the causes you believe in and invest in the success of others. #GivingTuesday has become an incredible force for good within the non-profit community, and tomorrow your gift to Global Growers will support our Home. Grown. campaign to enhance our network of community gardens. Learn more about our campaign here and stay tuned for more stories from the garden and the talented growers and their families. 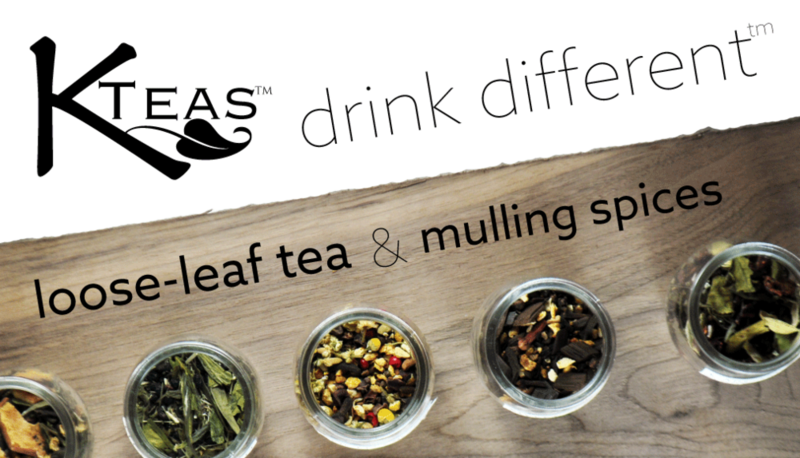 At the heart of K-teas is the marriage of Dustin and Katie Watts. They discovered a mutual love of tea on their first date in Washington, D.C., were inspired by the spice markets of Istanbul on their honeymoon, and started K-Teas in Atlanta in their first year of marriage. Make up for all the Thanksgiving pie with a Moroccan inspired dish that is sure to add warmth to your table this week. Hurry, Holiday Basket Sales End this week - November 22nd! Sample Holiday Basket. Baskets must be ordered before November 22, 2018. Over the next 7 weeks, we invite you to show your support for hundreds of people as they put down roots in their new HOME and GROW healthy food for their new community. An easy introduction to gai lan that can't go wrong: Stir Fry Gai Lan. Try it in lieu of your go-to Chinese take out! Add some protein and serve with rice to make it a meal. Looking for a unique holiday gift? We’ve got you covered! It’s not too late! There is still time to order your Holiday Baskets. Each basket contains a handpicked selection of locally made craft-foods. These are a great choice for anyone looking for a gift for a colleague, teacher or friend! Feel good about the gifts you give this year and support a cause you already know you can stand behind! Baskets must be ordered before November 22, 2018. Baskets will be ready for pick up at the Global Growers booth at the Decatur's Farmers Market on December 5th from 4-7 pm. Thanks for a fun evening at The Learning Kitchen! I had a really great time hanging out with some of our Farm Share members on Monday evening. Lyn Deardorff of Preserving Now gave a great class all about canning. Each of us left with new knowledge of canning to help us preserve our Farm Share veggies to enjoy year round! A big shout out to Lyn for teaching us one of the “lost arts”. Check out the photos below to see how it all went down! A fine group of canners. Dilly carrots! Made with carrots grown by Farmer Than at Bamboo Creek Farm. Really excited about dilly carrots. Chris is impressing all of us with his immersion blender skills. Brian here is also excited about dilly carrots. And apple butter. Choose Your Own Partner Product! We’ve had some really great partner products this year and now is your chance to re-up! You may even get a chance to try something you may have missed out on. Each site will have a variety of products to choose from. They will go on first-come first-served basis so get there early to snag what you want! This storage tip can be applied to most leafy fresh herbs. If you you’re not going to use all of your cilantro right away, this is the best way to keep it fresh for a couple of weeks! Place the cilantro in a small jar with enough water to cover the ends. Cover the jar with a plastic bag (any sandwich bag works well) and place in your refrigerator. Grab stems as you need them. Another great way to always have cilantro on hand is to chop it and freeze it in an ice tray with either water or oil. This way you have fresh cilantro anytime of year! I get asked often if you can cook and eat the greens of hakurei turnips. The answer is always yes! Hugh Acheson, chef/owner of several Georgia restaurants including Empire State South and The National has a delicious and easy recipe that calls for both roots and greens of your turnips. Who knows, maybe this dish will end up on your Thanksgiving table this year! It’s November 2nd and we all know what that means…time to start thinking about those holiday gifts! This year we are selling Holiday Baskets. Each basket contains a handpicked selection of locally made craft-foods. These are a great choice for anyone looking for a gift for a colleague, teacher or friend! Thank You For Joining Us for our Farm Fall Celebration! 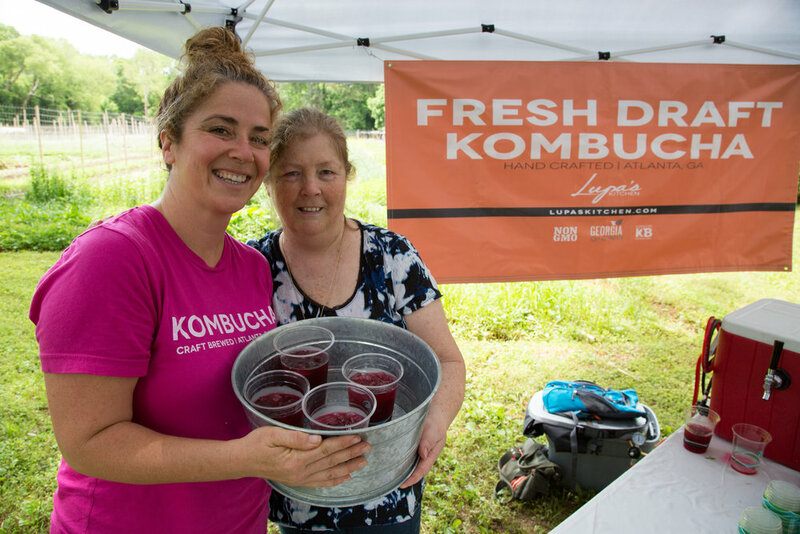 Thanks to everyone who came out to Bamboo Creek Farm for out Fall Farm Celebration! It was a lovely afternoon of s’more making by campfire while sipping warm beverages. Thank you to Mercier Orchards for providing us with some delicious cider! Todd gave a very informative farm tour where we were able to get a look at the new caterpillar tunnels that will be used for growing produce this winter. It was great to spend some time hanging with all of you! Even if you can’t make our preserving class on Monday, November 5th, you can still take home Preserving Now Apple Butter. Made from Mercier Orchard apples grown right here in Georgia. Perfect for the season! If you want to keep your radishes fresh in the fridge for up to two weeks here’s what you need to do: when you bring your radishes home, first remove the stems. Give your radishes a good wash and trim their tops and bottoms off—this helps them stay dry in your fridge. Keep the newly washed radishes stored in the refrigerator in an airtight bag or jar in your fridge layered between lightly damp paper towels. Voila! Fresh radishes for days and days! If you’re struggling with ways to get through all your produce this week, or just love salads, look no further! This delicious side calls for beans, peppers and arugula. Learn How to Preserve Your Produce with Preserving Now! Looking for something original to give this year for holiday gifts? Here’s your chance to learn a new skill and impress all of your friends and family this year! We have joined forces with Lyn Deardorff of Preserving Now to offer our members a preserving class at The Learning Kitchen. Lyn has been canning and preserving for more than 40 years in her home in Atlanta. She has completed coursework and been awarded a Certificate of Master Food Preserver from Cornell University Extension Service based in Ithaca, New York. She has also completed additional coursework in food science at the University of Georgia. As a requirement for processing and selling low-acids foods (such as pickles and salsas), Lyn has completed the University of Georgia “Better Process Control School” training and subsequently received certification as awarded by UGA and the Georgia State Department of Agriculture. Learn how to pickle carrots from our farm and make apple butter with Lyn on Monday, November 5th from 6-8 pm. Thanks to Preserving Now, we are offering this class to our members at an exclusive Farm Share member price of $35 (that’s $40 off the normal class price). There is only room for 12 members and registration is first come first serve, so be sure to sign up A.S.A.P! In the Mountains of North Georgia, from April until June, the “Bee Wild” bees travel 2-3 miles from their hives to gather nectar of blackberry, tulip poplar, and hundreds of other flowers. This wide variety of nectar sources is what gives Wildflower Honey its depth and complexity, much like a fine Cabernet. Enjoy this treat as a sweetener in tea, with a robust cheese such as goat cheese, or as a glaze on chicken or salmon. Apples are happiest when kept cool at a high humidity. Store them in the crisper drawer in your refrigerator kept in a plastic bag with holes in it or cover them with a damp paper towel. Be mindful about what other produce lives in the crisper, Apples give off ethylene gas with can cause other items to decay faster. A new take on eating your greens! This recipe sounds like the perfect dish for a chilly and rainy fall evening. We have joined forces with Lyn Deardorff of Preserving Now to offer our members a preserving class at The Learning Kitchen. Learn how to pickle a veggie from our farm and make apple butter with Lyn on Monday, November 5th from 6-8 pm. Thanks to Preserving Now, we are offering this class to our members at an exclusive Farm Share member price of $35 (that’s $40 off the normal class price). Sign ups begin Monday, October 22nd! The Fall Farm Celebration is only one week away! Come check out Bamboo Creek Farm in Stone Mountain and learn about where all of your weekly produce is grown. We will have warm cider provided by our friends at Mercier Orchards, a campfire (with marshmallows of course) as well as an exclusive farm tour for our members. Bring your friends and family to this fun fall event, I’d love to see you all there! This is the oil that got it all started in 2012. Clay grew sunflowers with the intention of harvesting and pressing them for oil that fall. Blessed with a good crop that year he purchased a press and made oil from sunflowers grown here on the farm. 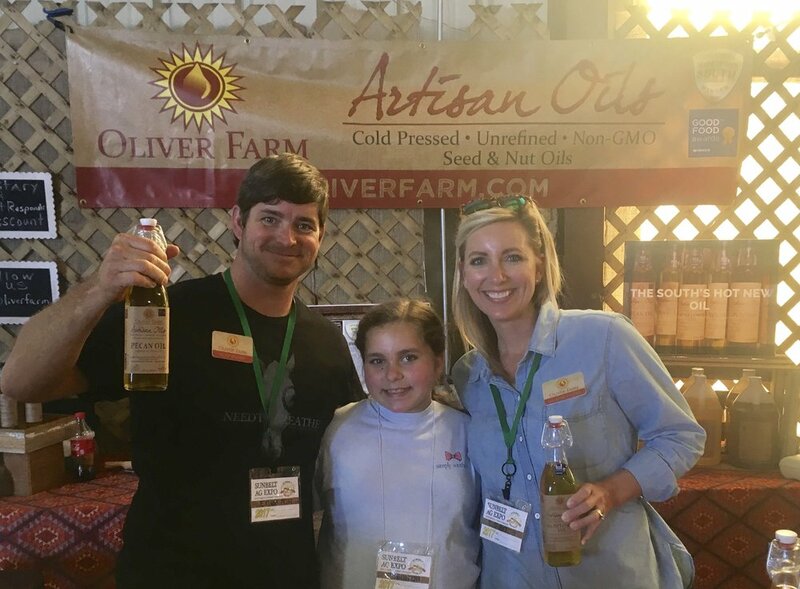 Oliver Farm Sunflower Oil has a bold rich flavor and is a bright yellow color. It is a great oil to use for light sauteing and its bold flavor is great on salads. Sunflower oil is also a great choice for using with high cooking temperatures and is also a good source of Vitamin E! What do I do with Dandelion Greens? Dandelion greens are super good for you! There are lots of ways to benefit from this bitter tasting leaf. Saute or braise them with lots of garlic and lemon-serve them as a side or mix in with pasta topped with a cheese like Parmesan. Juice them for a quick liver cleanse. You can incorporate them into a salad tossed in a citrusy vinaigrette. Swap out half the amount of basil for a batch of pesto. A natural diuretic and full or Vitamins A, C, K and B2, dandelion greens also have more iron and protein than spinach! So eat up! If you’re struggling with what to do with your dandelion greens try making a pesto with it! Would go great with your Oliver Farms Sunflower Oil. Freeze your pesto in ice cube trays to have on hand at any time. I wanted to re-share this video for our new Farm Share members this season. 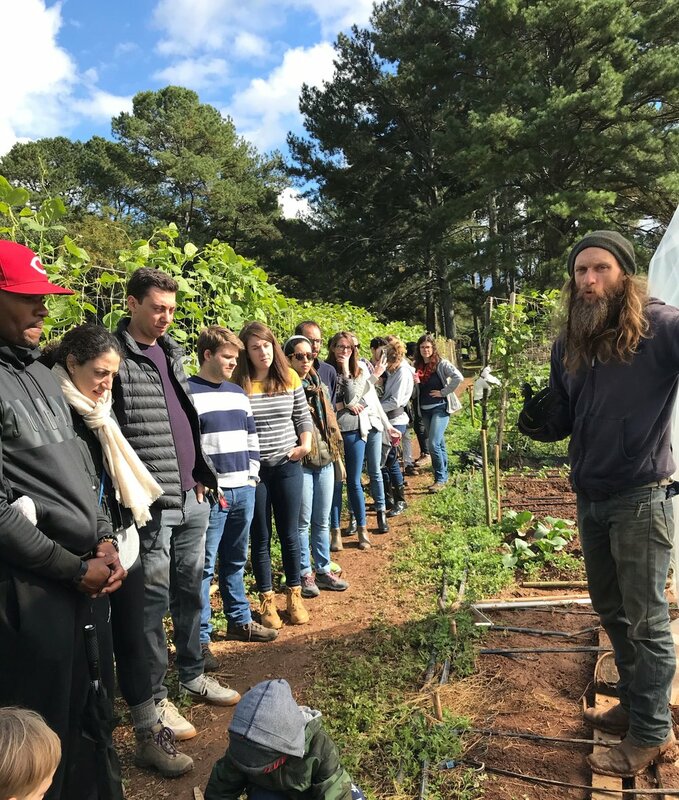 The lovely people at Upworthy Video came to Bamboo Creek Farm to talk to us about our work at Global Growers and hear from two farmers about their experiences. Than and Lal are just two of the farmers that are directly impacted by your weekly investment in our Farm Share. Come see for yourselves on October 27th for our Fall Farm Celebration! Please RSVP by October 22nd and let us know how many folks you will be bringing along. We will be participating in this year’s Socially Responsible Vendor Fair on Wednesday, October 17th hosted by the Immaculate Heart of Mary Women's Club. This will be a great opportunity to get some early holiday shopping done, and know you will be supporting some great local businesses as well. Plus, I’ll be there sharing all about Global Growers with a few veggies in tow. Verdant Kitchen™ is a gourmet and wellness company focused on the ginger and turmeric family of spices. Their roots are in the sandy loam of the coastal lowlands of Savannah, GA.
Their delicious Ginger Bites are great mixed with goat cheese, sprinkled in a salad or simply eaten as a snack. A yummy vegetarian taco recipe that can be enjoyed not just on Tuesday! Join Us For Our Fall Farm Celebration! We want to say thank you to all of our Farm Share members and invite you our to Bamboo Creek Farm on Saturday, October 27th for a festive fall afternoon. We will be serving warm cider, light snacks, and giving an exclusive farm tour. Bring along your friends and family and come hang with us! Commonly known as ‘Japanese mustard spinach’, komatsuna has been grown in Japan since the 18th century. It gets its name from the area in present-day Tokyo near the Komatsu-gawa River. It is a leafy green with a flavor has been variously described as a mustard-spinach cross, or mild-mustard cabbage. But komatsuna is neither a spinach or a mustard, though it is a member of the brassica family. It is high in calcium, vitamins A and C, and contains more iron than spinach. It is best eaten steamed, lightly boiled or added to a stir-fry. I love roasted veggies, but its good to branch out from time to time. This recipe changes it up for those looking for another way to enjoy the fall bounty! Thanks for a great first week of the second season of Farm Share. It was great to meet some of you and I look forward to getting to know more of you throughout the season. We’re Building New High Tunnels! Currently, we only distribute food on behalf of our partner farmers from April to December, despite the year-round enthusiasm for fresh, local food. These simple, metal-framed structures create a protected environment for crops. Think of them like unheated greenhouses that still offer temperature and humidity control, without depending on heating and cooling equipment. By protecting crops from harsh field conditions such as wind, rain, and hard freezes, we can extend the standard growing season. In other words, we can jump-start winter vegetables by raising the temperature in a closed high tunnel, and we can also lower the temperature with shade cloth during the hottest summer days. This means increased variety for consumers and longer harvest windows for farmers. Their wheat is grown, by their family, in Bleckley County, Ga. After harvest, they take the wheat berries, put them in a commercial mill, and grind them between 2 stones. This produces “virgin” whole-wheat flour. It is referred to it as “virgin,” because it is unaltered from the berry to the flour. This is “true” whole-wheat flour unlike anything you get off a shelf. Why is fresh milled flour so important? It’s actually very simple. Flour has the most flavor at the moment the berries are milled into flour! At this moment, the nutrient content is also at its highest! As time goes on, flavor and nutrient composition decrease. Gai Lan literally translates to “mustard orchid”. It is the Cantonese name for Chinese broccoli or Chinese kale. In the brassica family, gai lan’s flavor is similar to broccoli, but slightly more bitter. It cooks quickly and can be stir-fried, sautéed, steamed and boiled. Store it unwashed in a plastic bag in your refidgerator. Use within three days. This is a super simple and delicious recipe! If you are not familiar with cooking with Pac Choi this is a great dish to start with. It’s works great with any protein and can be made a meal just by adding rice. Welcome to Season 2 of the Global Growers Farm Share. This is your first member newsletter for the Fall Season! Being a Global Growers Farm Share member is one of the best ways to show support to the famers we partner with. Each week’s basket is full of produce grown by farmers who work hard to provide you with healthy, naturally grown food. Each farmer receives 75% of the sale of vegetables included in each basket. Global Growers stands firmly behind this percentage and hopes to initiate change in other Farm Share subscriptions. We thank you for your participation and support as we work to change the farming systems and bridge the gap between farmer equity and refugee resettlement. Looking to a great Fall Season and don’t forget to bring your own bag to your pickup! Daikons are a large variety of radish commonly found in Japanese cooking. They are typically sweet and mild in flavor and can be very versatile. It can be treated like the smaller varieties of rashish we are used to seeing and served as a raw veggie for dipping or in a salad. Try throwing it into a stir-fry or fall soup (it is officially soup season, isn’t it?). Pickle it to keep it around longer—it’s great mixed in with a salad or added to a sandwich. If your daikon comes with the leaves still attached, cut them off and store both pieces separately in the refrigerator. Ok, I know that this may seem like a lot to ask for sandwich making, but I have faith that you are an adventurous bunch who are always looking to bring that “wow factor” to your weekly lunch. This recipe hails from the once popular Brooklyn spot Saltie (r.i.p.) and brings a whole new life to the veggie sandwich. The beauty of this recipe is that most of it can be made ahead of time. Just assemble and your good to go!